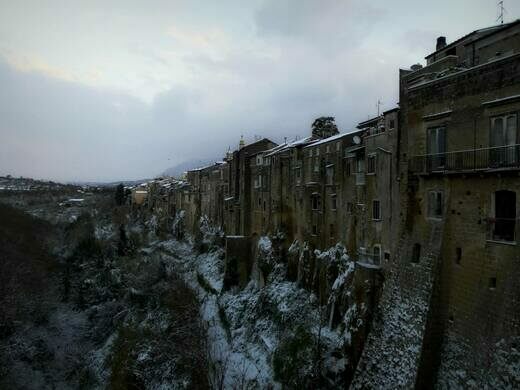 Sitting on a raised bluff near the “ankle” of the Italian boot, the historic town of Sant’Agata de’ Goti ends in a sheer drop into a river gorge, creating a long, flat wall as though the builders hit some invisible wall and just stopped. Originally established all the way back in 313 BCE the lovely town has changed leadership a number of times over the centuries. First founded by the ancient Samnites and later taken over by the Romans, and then the Goths, the cramped little town was not given its current name until the 1300s, having been named after a local noble. The site as it stands today was built as many medieval villages with tight, winding streets made for people but not modern vehicles. It is this very inaccessibility that helps the town maintain its old-world charm. The stunning town ends abruptly at the edge of the river gorge that forms one of its borders. The tall architecture stops on the lip of the bluff, creating a long and lovely, unbroken wall pocked with residential windows. This natural wall acted as a defense for the town in the past. Sant’Agata de’ Goti manages to maintain its quaint historic flavor even while it looks like something from a past that that is closer to a fantasy novel.